In a small saucepan, bring orange juice to boiling. Remove from heat; stir in cranberries. Let stand for 5 minutes. Drain cranberries, discarding orange juice. Place one-fourth of the cranberries and one-fourth of the Parmesan cheese on the center of each of 4 patties. Top with the remaining patties; press edges to seal. For a charcoal grill: Grill patties on the greased rack of an uncovered grill directly over medium coals for 14 to 18 minutes or until no longer pink (165 degrees F)*, turning once halfway through grilling. (For a gas grill: Preheat grill. Reduce heat to medium. Place patties on greased grill rack over heat. Cover; grill as above.) 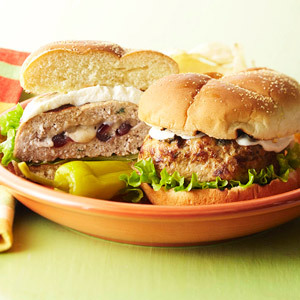 Top each burger with a slice of mozzarella cheese. Grill, uncovered, about 3 minutes more or until cheese begins to melt. Serve burgers on toasted rolls with lettuce leaves. Makes 4 burgers. * The internal color of a burger is not a reliable doneness indicator. A chicken patty cooked to 165 degrees F is safe, regardless of color. To measure the doneness of a patty, insert an instant-read thermometer through the side of the patty to a depth of 2 to 3 inches.